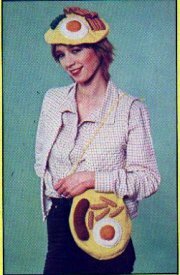 Here's a chance to knit your very own stylish fried breakfast hat and handbag from the pages of the Jackie Annual 1979. What you'll need: NEEDLES: A pair of 4mm (no 8) needles. WOOL: 3 (40g) balls of Sirdar Double Crepe in Lemon, oddments of DK in beige, brown, pink, white, yellow and green. PLUS: A 15cm nylon zip. TENSION: 22sts and 28 rows to 10cm square stocking stitch. ABBREVIATIONS: K - knit, P - purl, STS - stitches, TOG - together, K - increase by knitting into front and back of next stitch, making 2 sts from 1. BERET: Cast on 121 sts and work 8 rows K1, P1 rib. Continue in stocking stitch (1 row knit, 1 row purl). Work 2 rows. Next row: (inc and K, K 13, inc and K), repeat to last 1 st, K1 (137 sts). Work 3 rows. Next row (Inc and K, K 15, inc and K), repeat to last 1 st, K1 (153 sts). Work 7 rows. *1st row: (K2 tog, K15, K2 tog), repeat to last 1st, K1. 2nd row: Purl. 3rd row: knit. 4th row: Purl. Repeat these last 4 rows, decreasing the amount of sts in brackets by 2 every time round - eg next row: (K2 tog, K13, K2 tog) to last 1 st, K1. Continue in this manner until 25 sts remain on the needle and a block of 4 rows has been completed. Next row: (K3 tog) to last 1 st, K1 (9sts). Next row: purl. Break off yarn, thread through sts on needle and pull up. Join seam. BAG: (2 pieces alike) cast on 153 sts and work 4 rows stocking stich. Repeat as for beret from * to end. CHIPS: garter stitch (K every row) used throughout. With beige wool cast on 6 sts and work 20 rows. Cast off. SAUSAGE: Stocking stitch. With brown wool cast on 20 sts and work 40 rows. cast off. BACON: Garter stitch. With pink wool cast on 60 sts and work 8 rows. Work 4 rows beige, 2 pink, 2 beige, 2 pink, 6 beige. Cast off in brown. EGG: Stocking stitch. With white wool cast on 56 sts and work 4 rows. Next row: (K2 tog, K3, K2 tog) to end. Work three rows. Change to yellow wool and work 2 rows. Next row: (K2 tog, K1, K2 tog) to end. Work 3 rows. Next row: (K3 tog) to end. Next row: purl. Break off yarn, thread through sts on needle and pull up. Join seam. Repeat for second egg. TO MAKE UP: Sew ends in and press all pieces lightly on the wrong side with a damp cloth. Sew bag pieces together leaving 15cm open. Sew in zip. Cut a 12 metre length of wool, fold in half and half again (4 strands). Make a loop in open end and slip over a door knob. Pull yarn taut and twist tightly. Bring ends together and yarn will twist. Attach to ends of bag opening. Join long side of chips to make tubes. Gather short ends of sausage and sew along length leaving an opening. Stuff with wadding, kapok or old tights, and sew up. Attach egg to beret by sewing around yolk line, padding yolk lightly with wadding. Sew edges of egg to beret. And there you have it! You'll be the envy of all your friends. Thanks! I've had a craving to knit up some fried eggs and bacon! That would be GREAT for Halloween here in the States!